scene in Paris. Reporter: Tonight in Paris, ������ the city, the whole nation really in mourning. The biggest symbol of Paris. To see all the preeshiers here who came here to gather, to mourn. I don't know what to say for the most beautiful monument of Paris. Notre dame, our lady of Paris to those who live here, a landmark ravaged by flames. Today the spire of this 850-year-old landmark burnt like a torch and finally collapsed. Oh, my. Reporter: Caving in the roof. Did you see that? No. Reporter: Engulfing the very center of this cathedral in flames. John dickas watched it all from his apartment. My partner and I were standing on the balcony, and that was moment that she started crying when we watched the spire fall down. It's such like an iconic part of the Paris skinline. Reporter: French president Emmanuel macron tearful, called the blaze a terrible tragedy. President trump had these words. 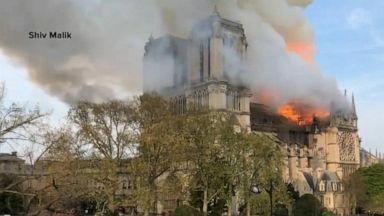 The fire that they are having at the notre dame cathedral is something like few people have witnessed. It's one of the great treasures of the world, and it's burning very badly. Looks like it's burning to the ground. Reporter: Some of the first images from inside notre dame have now been released. The altar where thousands would have flocked to celebrate Easter Sunday this week now covered in ash. It took 500 fire fighters to battle the flames, at times they were powerless to stop them. There's no question. I'll tell you that for me the most heartbreaking moment is when I saw about 20 minutes after I -- I started watching the fire, I saw the -- the ladders go up and the hoses start spraying, and it was just heartbreaking to watch. The ladders were not tall enough. 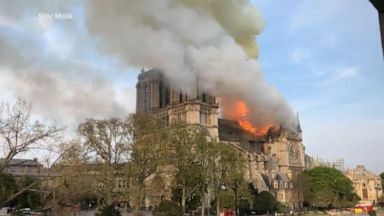 The hoses were not strong The first reports surfaced at 6:50 P.M. Paris time, an ominous billow of spoke coming from notre dame. Me hand my mom are going on a sunset cruise on the seine, like a champagne cruse and when I got on the boat one of my friends texted me saying that notre dame is on fire, and we couldn't see it at that point, but we were kind of shaken up and everyone was like are you sure? Are you sure that's what's happening and then our boat started going down the river, and could you see the smoke just raising up, and then eventually you could see the flames going up and eventually the tower came Just a fire in the background. Wow. The horror of onlookers flames then burst through the ceiling. The inferno raging out of control. Rescuers scrambled to save some of the cathedral's precious art and priceless relics, among them a tiny piece of Christ's crown of thorns housed in the spire to protect against lightning and other harms. Miraculously the main structure of the cathedral appears to have survived. Those two iconic towers at the end still standing. It took more this a century to build this church. Construction began in 1163. The two massive towers finished around 1245, considered a triumph of French gothic style. The building is French history carved in stone and watched over by gargoyles. This is one of the most important landmarks in France still standing tonight but smouldering as well, and a full assessment of how bad the damage is, we'll have to wait until first light. Meantime, there's a feeling of great sadness here, and all along the seine people are singing hymns. ������ Reporter: Notre dame survived the French revolution. This is where Napoleon was crowned emperor of France. It survived two world wars, and the Nazi occupation. The heart of France. Its cultural significance cannot be underestimated. Victor Hugo immortalized the notre dame with his hunchback, a story that Hollywood has told and retold over the years. I have chores to do. It -- it was nice seeing you again. Oh. Reporter: Notre dame is said to be the most visited location in all of France. 13 million tourists a year. That's nearly double the foot traffic at the eiffel tower. The cathedral was undergoing a $6 million renovation project. Just days before statues of the apostles were taken off the rooftop to be cleaned so tonight they were spared. While the cause of this fire is not yet known, authorities are investigating if it might have been linked to the construction work. Now the reconstruction work will have to begin all over again with how much more damage to undo. Macron has vowed to rebuild, but what stood for centuries could take a generation to restore. Can they rebuild? I don't know if I will be alive when they will finish to rebuild it. It will be very complicated. Reporter: Complicated, yes, and tragic, too. 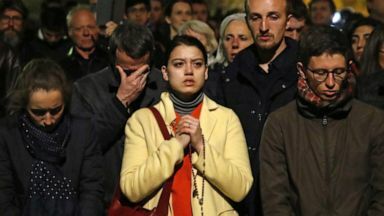 ������ Reporter: But notre dame is the heart of Paris, and the French people are determined to do what they can to save it. ������ Reporter: I'm David Wright for "Nightline" in Paris. Our thanks to David. We'll have coverage throughout the night and first them on "Gma."